This large park was designed in the late 1930s and has two very different areas and styles with one dedicated mainly to sports with fitness circuits, football and tennis courts, childrens playground and even outdoor gym equipment, yet it also has a cascade style fountain, ponds, lovely lawns for picnics and plenty of trees and other flora to enjoy. 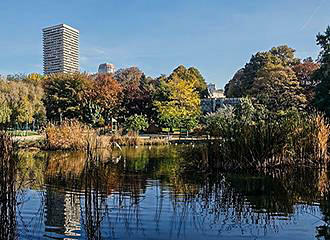 Now the Parc Kellerman covers an area of over 5 hectares and is the largest park within the 13th Arrondissement of Paris, which was designed by the landscape architect Jacques Greber after the 1937 Universal Exhibition or World Fair as it was then known as. It was laid out on part of the old Thiers fortifications that were destroyed after World War I, having been deemed a disaster and useless during the 1870 war with Prussia, yet there are still a couple of remants of this high wall and fortifications remaining within the park. 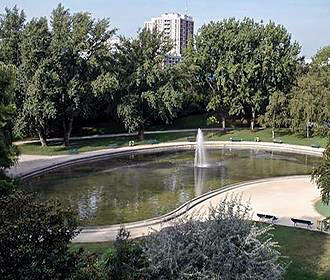 But the Parc Kellerman was also laid out on top of the covered Bievre Riviere, or Beaver River, which is a subsidiary of the River Seine, that was covered over in the 1900s, just like the Square Rene le Gall was. Now when the 1937 World Fair in Paris was in full swing, with the Palais de Chaillot being inaugurated along with the impressive Trocadero Gardens, the area where this park now sits was also utilised for buildings and pavilions for this event, and so, there are still some reminders of this within Parc Kellerman. And this park in Paris was named after Francois-Christophe Kellermann, who won the Battle of Valmy against the Prussians in 1792, before being given the title of Marshal of France in 1804 during the reign of Napoleon Bonaparte. Yet, getting back to the park itself and what you can discover, there are actually two very different and distinct areas, as it was not designed purely for pleasure, as it was laid out to promote sports and fitness. So, there are actually three different fitness trails of varying lengths going around the park, which are accessible from the entrance on Avenue de la Poterne des Peupliers. 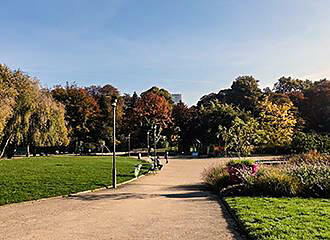 And having been renovated in the 1960s, there are now two football fields, tennis courts, lovely childrens playgrounds and table tennis tables, which are in the western side of the Parc Kellerman, yet there are also expanses of lawns that are ideal for sunbathing or picnics during the warmer months. You will find that there are different entrances to the Parc Kellerman, yet the one on the upper level by the Boulevard Kellerman, has an Art Moderne style entrance colonnade constructed of bricks and cement, typical of 1930s styling. And there are two bas reliefs located on this, one depicting dancers and the other depicting athletes, which were produced by the artist Elie Ottary. 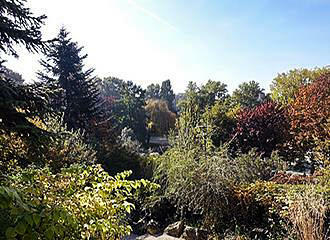 This area is also close to the Boulevard Perepherique, which is a shame because you can hear the noise from the traffic, yet from the upper level of the park you can look down on the lower level of the Parc Kellerman, which is a far more natural type of area in the Napoleon III style. 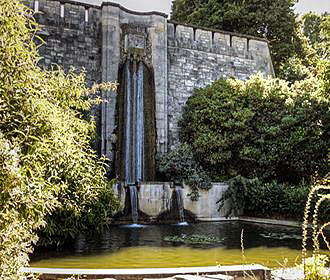 Plus there is a water feature with a short stream that runs from the upper level through pools and a cascade of artificial rocks going down to the lower park, where it enters large kidney-shaped basin with a fountain, and in 2011 the pond was decorated with aquatic plants and fish were also introduced to the pond. There are also two staircases that lead you up to a terrace area, however, in 2012, some other improvements were conducted to the Parc Kellerman including making some pathways that would be accessible to the disabled. And when it comes to flora, there are numerous different species of trees including linden, weeping willow, lime, cherry trees etc, not forgetting the beautiful flowebeds and bushes. Yet this park in Paris is also home to a lot of different fauna including ducks, plus there is an apiary, or beehives, that was founded here in 1988. So as you can tell, the Parc Kellerman has a lot to offer, yet is one of the very little known parks in Paris, on the outskirts of the city, but is a great place to relax or bring the children for a bit of fun. As we have mentioned before, the Parc Kellerman is located on the outskirts of Paris in the 13th Arrondissement and is open from 8am on weekdays and 9am on weekends and National French holidays. However, closing times vary depending upon the time of year, and can be as early as 5.30pm in January, through to as late as 9.30pm in August. Now, there are actually three different entrances to the park, one on the Rue de la Poterne des Peupliers, another on the Boulevard Kellerman and the third on the Rue Max-Jacob, and although improvements have been made over recent years for accessibility, some areas will still be difficult or inaccessible for the disabled. Yet you may be pleased to know that there are plenty of park benches in different areas of the garden, public toilets, three different drinking water points and even a kiosk selling drinks, ice creams and other snacks during the warmer months, plus there is WiFi access available. So when it comes to getting to the Parc Kellerman via public transport in Paris, you will find that the nearest Metro station is the Porte d’Italie stop serving line 7, which is also a Tramway stop for the line T3a.